On the eve of the one-hundredth anniversary of the Nineteenth Amendment, which granted women the right to vote, New York Senator Kirsten Gillibrand introduces children to ten suffragists who raised their voices for justice. 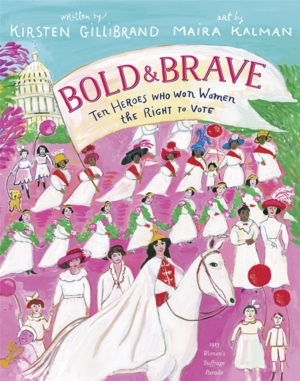 With illustrations by The New Yorker contributor and artist Maira Kalman, Bold and Brave profiles courageous visionaries including Susan B. Anthony, Sojourner Truth, and Alice Paul. Senator Gillibrand is also the author of the 2015 New York Times bestseller Off the Sidelines: Speak Up, Be Fearless, and Change Your World, “one of the most helpful, readable, down-to-earth, and truly democratic books ever to come out of the halls of power” (Gloria Steinem).